This past June, at the Drug Information Association (DIA) annual meeting, I had the opportunity to present and participate in a panel discussion on innovative approaches to ensure quality and compliance in clinical trials. Not surprisingly, a majority of the discussion focused on sponsor responsibilities for building quality into its clinical program, as well as the responsibilities of investigator sites participating in clinical trials. As often happens, there was a lull in questions being asked to the panel, so I took the opportunity to ask a question to the audience: How do we address the issue of patients enrolling multiple times within the same clinical trial, or multiple times within the same clinical program? Unfortunately, there was no good solution offered to this problem, even from individuals representing regulatory agencies. Patient privacy makes it difficult to identify instances of the “professional patient.” To address individuals who may enroll in multiple clinical trials within the same development program, the best advice was to include exclusion criteria in each protocol that prevents someone from participating a second (or more) time. This might be effective if patients try to enroll within the same site for multiple studies, but it will likely not help if they try to enroll elsewhere. In a previous post, I discussed ways to try and identify these subjects using birth dates and initials as a way to match potential re-enrollers. Demographic and physical characteristics can help highlight the interesting matches. But rules on patient privacy may mean that data on birth dates and initials are not available in the study database. For example, clinical sites in Germany can only provide the birth year for study participants, which makes this data far less useful to identify potential re-enrollers. 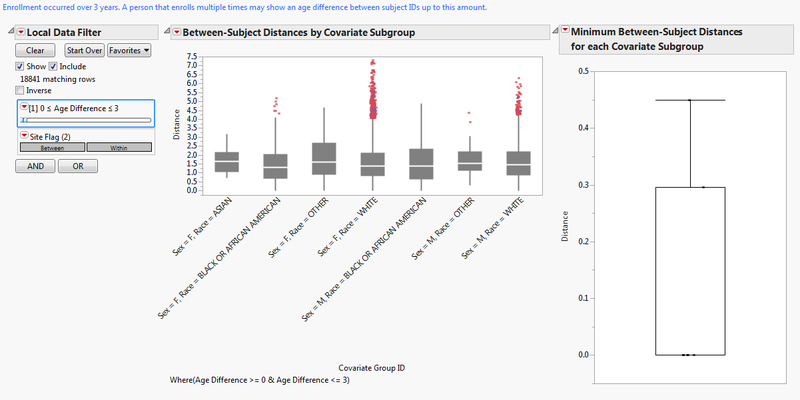 Because data on initials or birth date may not be available in the study database, JMP Clinical 5.0 offers a new method to identify potential re-enrollers using data collected at the study site. The Cluster Subjects Across Study Sites analysis calculates the similarity between pairs of patients within subgroups based on gender, race and/or country (user-specified) using pre-treatment data on vital signs, laboratory measurements, physical examinations etc. (Figure 1). Users can further highlight interesting pairs of subjects as those within a few kilograms or centimeters of one another, or those within a small range of age differences (which can vary depending on the duration of the clinical trial). Further, cluster analyses help identify sets of subject IDs for those individuals who may have participated three or more times. While I have presented these analyses in the context of identifying subjects who re-enroll within the same clinical trial, the same approaches can be used to identify patients who have participated in multiple studies within the same clinical program. If these cases are identified early, sponsors can minimize the amount of data collected on these individuals. If you want to learn more about the issue of identifying re-enrolled subjects in clinical trials, you may want to pick up a copy of my new book Risk-Based Monitoring and Fraud Detection in Clinical Trials Using JMP and SAS, which is being released today (you can buy it soon now!). Let me know what you think of the book.